In this issue we will discuss different types of water boilers and their most suited applications. Stay tuned at the end for "On This Day" and some special history about Johnston Boilers. Tune in next month for the steam boiler edition. Here is a short clip about boiler condensate from a recent lunch presentation by Greg Hahn. Water boilers are available for condensing applications or non-condensing applications. 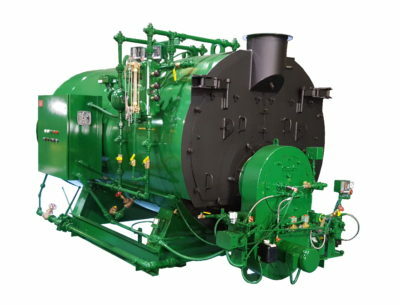 Steam boilers are available in both low and high pressure, and have designs which require the condensate to return to the boiler or models for producing industrial steam for process, without condensate return. Patterson-Kelley’s stainless steel boiler breaks through the limitations of all other stainless designs with our revolutionary DUET TM technology. It’s the industry’s first heat exchanger comprised of two unique chambers built to optimize the turndown process. This unique design allows the P-K SONIC ® to operate at 97% efficiency with a 5:1 turndown and ultra-low emissions. ﻿Sizes available from 650 MBH to 4,000 MBH. Woodmaster biomass-fired wood pellets or wood chips up to 6,800 MBH and 92& LHV efficiency! The decision on whether to use a condensing water boiler or not depends on the return water temperature coming back to the boiler. If the temperature will be less than 130F for prolonged periods of time, then you should consider choosing a condensing boiler. Condensing boilers are designed to withstand the corrosive nature of the condensate produced with return temperatures less than 130F. FUN FACTS: Johnston Boiler Company was started in 1864 in Ferrysburg, Michigan by John Watt Johnston who was a direct descendant of James Watt, the steam engine pioneer. They built their own boats and powered them with their own steam boilers. Their facility was destroyed by fire in 1871 in the Great Chicago Fire but they rebuilt and carried on. 60 Johnston Boilers were used while building the Panama Canal. In 1978 Johnston Boiler supplied a boiler to an Antarctic Expedition that was used to punch a 2-foot diameter hole through 1,500 feet of ice. 154 years later, Johnston Boiler is still privately owned and fulfilling the company tradition of Quality, Dependability, and Efficiency.